Are you moving house, flat or office in Twickenham? It might be famous around the world as the spiritual home of Rugby Union, but if Twickenham is going to be your own private home for you and your family, you’ll want the support of a professional removal service to move you in with the minimum of fuss. We cover the whole South West London area, including Twickenham and its neighbouring boroughs, so it’s no problem transporting all your furniture, appliances and heirlooms over the Thames or along the riverside. In fact, central London is only 10 miles away. As one of the capital’s most exclusive suburbs, we’re used to completing removals in elegant Grade II buildings, upmarket townhouses, or stunning riverside hideaways. 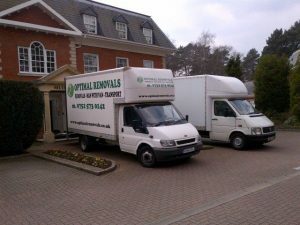 We have plenty of experience of providing fast, efficient and discreet removals for the luxury houses around Strawberry Hill and Marble Hill Park, or loading and unloading with minimal interruption on the residential avenues around St. Margarets. We’re also skilled at finding the best solution for terraced houses, flats and apartments, no matter what floor you’re on, or how narrow the access. So if you’re moving to the home of rugby, or crossing town away from South West London, ask us for a quote on the quickest, safest removal.